Our new series of controls with 115 volt piggy back cord’s are designed to be used with our series of no electrician required exhaust fans, re-circulation fans and power shutters. All these products come complete with cord. You plug the control into the wall receptacle and then plug the fan or inlet into the back of the control cord. When using an existing circuit you must make sure the circuit will handle the motor amp capacity. 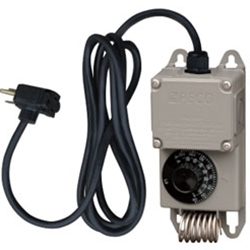 This thermostat can be used for heating and cooling, exhaust fans, re-circulating fans, inlets and heaters. The plastic NEMA 4 housing with stainless steel sensor is ideal for any harsh environment including hog, poultry, dairy barns, greenhouses, high moisture applications, industrial and commercial buildings. Although loaded with features, it is priced well below most lower quality controls available in the market today. Note: All VC15–C are wired for 120 V. If you want to use for any other voltage the cord can be removed and hard wired. We recommend using a qualified electrician for this or purchase our VC15 without cord.